Cut salmon fillet into 8 serving pieces. Place salmon in pan. Drizzle 1/4 cup of the lemon juice over salmon. Bake 15 to 20 minutes or until salmon flakes easily with a fork. Meanwhile, in medium glass or plastic bowl, mix mangoes, chile, cilantro and remaining 1/4 cup lemon juice. Serve over salmon. Mangoes contain carotenoids, plant pigments that add orange and yellow color. Carotenoids are antioxidants that help protect cells from damage. Always read labels to make sure each recipe ingredient is gluten free. Products and ingredient source can change. 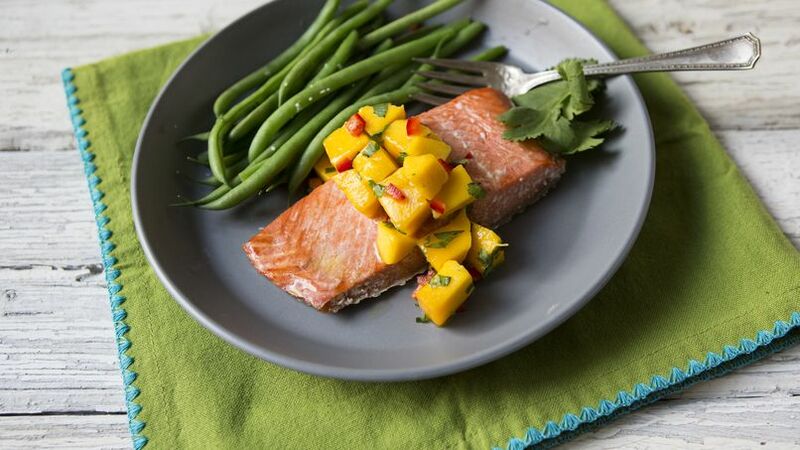 Fresh tropical and southwestern flavors mingle in a sensational three-ingredient mango salsa.